Measuring range :(0~1250) μm, depends on probes. maximum 10mm for the probe F10. Refer to Appendix. Memory for up to 20 files (up to 50 values for each file) of stored values. Power source: Two “AA” size, 1.5 Volt alkaline batteries. 200 hours typical operating time (EL backlight off). * With different external probes, the gauge can be applied to measuring thickness of non-magnetic coating on magnetic metal substrate, as well as non-conductive coating on non-magnetic metal substrate. * Five types of probes (F400, F1, F10, N1, CN02) are available for different application. F10 probe measures up to 10mm. * Two measuring modes: single or continuous, changeable. * Two calibration methods can be applied to the gauge; And the system error of the probe can be corrected with the basic probe calibration method. * Measured values and user information are shown on a large, easy-to-read LCD. A display back light ensures easy reading of screen data in poorly-lit conditions. * Measuring status indicator showing the measuring status. * The gauges’ user-friendly measuring system permits automatic storage of up to 1000 readings in one memory matrix for later statistical evaluation. * Battery information indicates the rest capacity of the battery. * Auto sleep and auto power off function to conserve battery life. * USB1.1 communication port. Optional software to process the memory data on the PC. 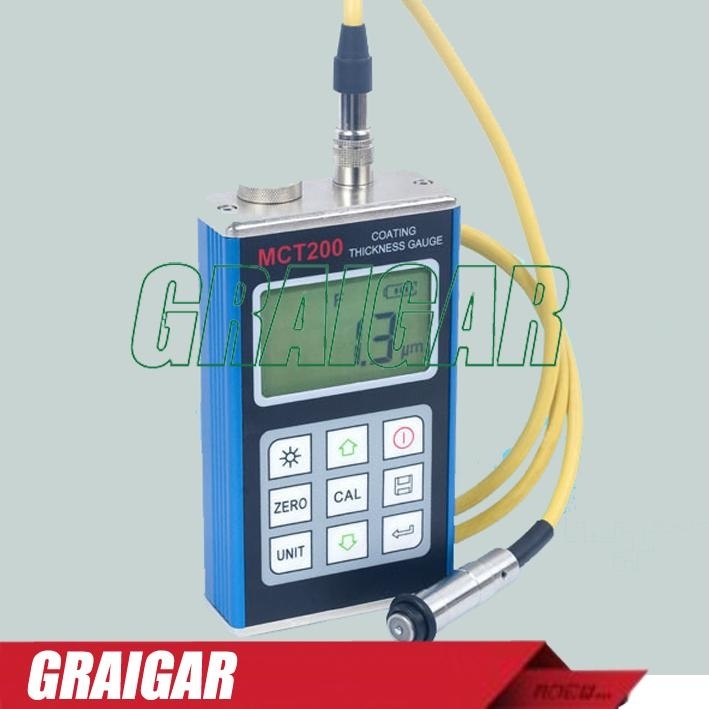 The gauge adopts two thickness-measuring methods: magnetic induction method and eddy current method. insulating coatings on all non-ferrous metals and on austenitic stainless steels, e.g. paint, anodizing coatings, ceramics, etc. applied on aluminum, copper, zinc die-casting, brass, etc. * The surrounding environment should avoid of vibration, strong magnetic field, corrosive medium and heavy dust.